Kelly Laule, a broker with Oaktree Realtors, and the owner of EichlerSoCal, focusing on Eichler mid-century modern architecture, invited us for a little pre-listing tour. My oh my. Still my beating heart. I think this rare 60s or 70s Porsche 911S comes with the house. Alright, I know. But wouldn't it be cool? Enough joshing around. Honestly, a perfect house and move-in ready. Nobody has added anything, subtracted anything or bashed anything in. Let's start the tour. This precious home is at 1733 North Shaffer Street in the Fairmeadow tract in Orange, California. This is one of three unique tracts of Eichler homes in Orange. Check out those six foot over hangs. The better to cool you on a hot summer day. You can see in the tip top photo, the little pony wall which is just out of sight to the left in this picture above. The wall protects the main walkway of the house and is a nice feature for hiding crap (e.g. shoes, toys, newspapers). Always thinking, I am. The greenery in the built-in planter is called Mother-in-Law's Tongue. Charming name huh? But it is attractive and low maintenance. We have a few around our new yard (not quite finished, pictures soon). Perfectly appropriate atomic back plate on the front door knob. Step into this stunning atrium. I love pavers. Although this house is a modest 1,660 square feet of living space. The atrium is another 464 feet (18' by and 24') and is partially covered. It is enclosed by four walls/windows. This makes a wonderful outdoor living room. The home feels much larger than it is, by design. There is a nice article over at EichlerSoCal about "Atrium Living." The atrium is an amazing feature with its stunning vaulted ceilings. The Eichler atriums are famous and partially attributed to this home's architects Anshen and Allen. 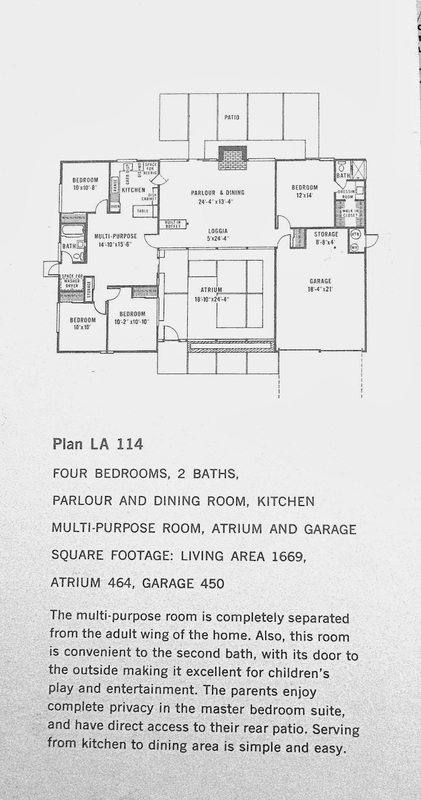 Here is a layout of the house, from what appears to be an original home brochure. (Thanks Kelly!). Enough teasing. In you go. Gasp. Hey you were thinking it? Right? This home was staged by Kelly and her clever friends. Most of the furniture is for sale, incidentally. Looking back to the front atrium door. The front door to the actual home is a slider. Oh so Southern California. Fantastic original built-in room divider between the entry way slider and the dining area. The kitchen is absolutely perfect. It lacks all the improvements, granite and fussy details that you see nowadays. It is very in keeping with the architect's original vision. But with modern appliances, sink and fixtures. Great butcher block counter top. We still have one of those! They are surprisingly resilient and easy to keep clean. Love the white Eichler globe lights throughout. Consistent and in keeping with the period. Looking back from the kitchen, you get a view of the multi-purpose room. And the hall back to the kids' bedrooms. The master is more secluded, on the side of the house that only includes the garage. View to the laundry room and door to side yard (plus clothesline). Who wants this perfect period walnut built in? Raise your hands!!! I see all hands are up — as well they should be. Let's grab a peek at the master with its perfect view out to the pool. It is 12' by 14' which isn't the traditional size of today's massive McMansion masters. My preference is for this size. And, frankly, the McMansions are rapidly losing favor. Oh so pretty and private in its own wing of the house away from the kids. More of Kelly's clever staging. A master closet was a very forward thinking design feature in its day (1962). Our 1955 home does NOT have anything close to a master, and we have been fighting over the meager closet space for years. Perfect master en suite with very modern sensibilities yet traditional Eichler design. Reminds me of choices we recently made in our remodel. The closet and bathroom photos show off the new white vinyl floors which are consistent throughout the home and cover the fabulous radiant heating. A laundry room was included in the original plans. Our modest mid-century modern only included a washer in the kitchen (you know, women's place and all that). We had to add on the laundry at a later date. And, the original clothesline to hang up wet towels and swimsuits. Onto the pool. Here is a side view which most accurately depicts the raised rear wall. Your view of the pool from the patio. And the six foot eaves keep the home cool on a hot summer day. Orange, California temperatures can range from the 80's to over 100° during the hottest summer months of July, August and September. Tall bushes for privacy. This lot is huge by Southern California standards at 8,500 square feet. Check out the perfect period mosaic blue tile. Back in we go through the slider. Let's take a quick look at the kid's bedrooms. All three are ten by ten which is how a 1,600 square foot home can have four bedrooms. But how nice. And, I don't believe in making children all that comfortable. Or guests for that matter. One bedroom with a view of the atrium. A bedroom with a side yard view. Perfectly functional and move-in ready. All the best views and space saved for the master and the rest of the house. As it should be! One last look back at the beautiful living room. Occupied by period appropriate guests. As inspiration for decorating an Eichler very similar to this one, take a look at this month's Atomic Ranch magazine.They feature a Fairhaven Eichler restored and decorated meticulously by Brent Harris, who famously restored the Kaufmann house in Palm Springs, with his now ex-wife. I saw a view of the Kaufmann house a few weeks ago on a Palm Springs Modernism Week Walking Tour. I vow to get in it some day. And a close up of the square block fireplace, painted white. I had a tangle on eBay trying to get a clock kind of like this one. And out to reality through the atrium door. Love the orange. RetroRenovation gives you the perfect colors to paint an Eichler. Just in case you were thinking about it. And one last shot of the globe lights. More pictures of this perfectly maintained Eichler can be seen on Kelly's site EichlerSoCal.com. The home will hit the multiple listing service this week for $715K. And, Kelly will be having Open House* on March 18, 29 and 30. Tempting, huh? *This is NOT a sponsored blog post (except by my own crazy Eichler enthusiasm). Thanks for letting me sneak in Kelly! Great house! So glad no one has "updated" it to death! No kidding. I was thrilled to see it in this condition. I loved this blog post, but it made me want to cry. I would LOVE to own a home EXACTLY like this one some day. I adore the idea of the way homes were made back then.....all the "living" should happen in the open plan areas....who cares if the rooms are smaller?! Love the yard and that pool. So gorgeous. The home is beautiful and, as you say, beautifully staged. The gray and white cabinets in the kitchen are striking, made more so by the splashes of orange on the counter. It is such a classy house. I am very tempted by those gray cabinets. They look upscale and sleek. Stunning thanks for sharing! The first picture looks almost computer made, so clean. What type of camera and how many pixels do you use? Well, thanks for the photography compliment. I use a Canon EOS Rebel (purchased in last several years). The pixels are default and high, but when uploading, I down sample for the website. Images are adjusted and cropped using Picasa which has an easy interface to Google Web Albums. Who has time for PhotoShop nowadays? Saw the American Dream Builder show on NBC, amazing what awful interiors they came up with. This Eichler house is way prettier. Love my Atomic Ranch magazine. Isn't Atomic Ranch good? The Eichler in the latest issue I have tagged for permanent archival (I am a notorious magazine purger). I liked the paint color choices, fabrics and furniture. It is mid-century with out the kitsch which is totally my aesthetic. I love everything about it. Rebecca. That's all. Fantastic write-up Rebecca! I had seen this house via Eichler SoCal and was itching for more –thank you for scratching that itch! :) Such a beautiful home. Amazing Mid Century Inspired Custom Sofa and coffee table provided by Casara Modern (casaramodern.com) along with the vintage Mid Century Modern furniture. Thanks to Eichler SoCal for the opportunity to showcase our furniture in your fabulous Eichler listing. Awesome and thanks for the link! They mentioned to me the sofas were new! Great house - thanks for sharing it! I see this house in my dreams ever night:) thanks for sharing. Homerun with this post and house, with such good use of space. "I don't believe in making children all that comfortable. Or guests...", "McMansions"...yes. Everything here looks well-thought-out, and preserved. Right to their patio furnishings, real overhangs, and the pool and the borowed view of their neighbor's yucca / banana planting...you donlt get that in a new neighborhood. The inside is perfect...where's my 715K hiding? Isn't it a good one? It is just perfect.